Music lovers all over the world have a huge range of music taste. From country music to hard rock lovers, the demand for music has increased by leaps and bounds. The enthralling feeling of great music soothes the psyche and persona of millions, if not billions, users. Since last century, people have been glued to their radio which is still in following. With the advent of the internet, everything around us changed, and Music and Radio were not untouched. Now, you can listen to hundreds of radio channels on your smartphone and even record your favorite songs anytime with great ease and simplicity. There are hundreds of apps that connect your world with the Musical dimension via Free Android App. Talking about such Android Apps, Audials has created its own place as the default choice of thousands of people. Whether it is Online Radio, WebRadio or InternetRadio, you can easily find the best radio stations corresponding to your favorite music by simply entering the information of the desired artist, language, genre, your locality or country. With Audials, you can discover and get along with the music as it keeps you on track. You can synchronize your Music with your Android Smartphone. This app also provides its user the ability to fast zap between various radio stations. The user just has to mention his/her favorite radio station or any artist from any genre. Along with this, the user can also zap quickly between various radio stations to find the perfect match according to his/her choice. Using this app, you can easily save MP3s from your favorite radio stations. It also offers you the top tracks from your favorite genre which are recorded automatically. The saved MP3 on the smartphone also get their ID3 tag along with cover art. This app allows you to save any track as an MP3 from the radio history, in case you like a song on the radio. Whether is news, current affairs, documentaries, or tech reviews, Audials cover the wide range of podcast, if not all. 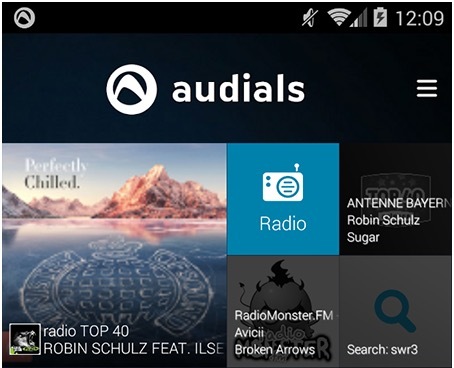 Using Audials App as a radio player or to play your favorite tracks, you can also customize your personal settings according to your wish along with the equalizer or you can select any presets like normal, dance, classic, folk, jazz, heavy metal, etc. You can now get Audials Android App for various 7 inch Android tablets like Google Nexus, Kindle Fire HD, Amazon Kindle. This app is available for free of cost without any type of advertising. It also provides best radio directory that is available for Android smartphone. Along with this, you can connect your smartphone to your PC without any cost which provides you direct access to your music collection. It allows you to record music even when you are on the move. You can use the app in landscape and portrait modes. Well, we didn’t find any major flaw or issues with this app, as its seamless interface and simple workflow makes it way too easier to handle, still we have listed few of its drawbacks. There can be more preset settings for the users to choose from. It also lacks other types of audio file format except MP3, to record the song. You also need to install an additional free software named Audials Light Windows to use your PC as personal media cloud along with recording various music and videos. This aspect can be appreciable or confusing for different types of users. 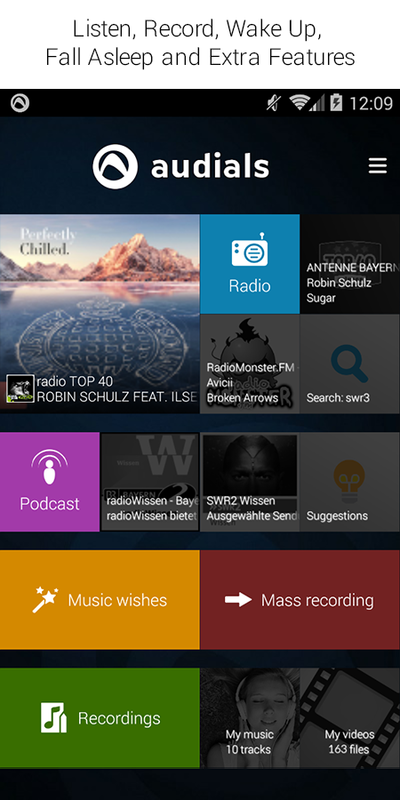 Audials Radio app is one of the best apps for listening and recording radio stations. It is different features like recording song from radio history, a huge range of equalizer settings, ability to access music resource on your PC via your smartphone, etc. make this app a great choice for users looking for an app which provides a seamless experience to listen and record radio stations. So go ahead, install this app, experience it and do let us know about your opinion and suggestions.